The open countryside reaches out before you and your horse. Just the noise of birds singing. You get that wonderful feeling of freedom! It’s one of the best feelings for any horse rider, being able to appreciate some alone time, just you and your horse. There are some risks to consider though. Rider safety is top priority when riding alone, so what can you do to ensure this? Whenever out on a ride it’s always recommended that Hi Viz is worn. This will make yourself and the horse more visible to drivers if you spend any time on or near roads. It also makes you easier to find if you fall and are unconscious. Wearing the correct safety equipment for both horse and rider is vital whenever riding. Good practice, when riding alone, is to do a riding route you know well. This will reduce the risk of getting lost. Also, you’ll know roughly how long this ride should take. If you don’t know any rides around your area there are equestrian apps that provide equine route planners. If unsure of the recommended route or not confident, walk the route on foot beforehand to familiarizing yourself with the route. Before setting off let someone know where you’re going and roughly how long it should take. This means they are alerted to a problem if you don’t return in the allotted time. And they can re-trace your steps to help find you. In this modern world nearly, everyone has some form of a mobile phone. Taking one of theses can help massively if you get into trouble. Ensure the phone is put in a secure pocket or pouch so you can’t drop it whilst riding. Many phones now allow you input medical information and emergency contacts (In Case of Emergency – I.C.E. contacts) that anyone can access if needed. So, making sure your emergency contacts are up to date and accessible is another thing to consider. Most smartphones these days have GPS on them. This can allow you to download equine GPS tracking apps. Apps such as these allow for someone, that you give permission to, to track where you are on your ride. Along with this there are also products and apps designed with rider safety in mind that have accident detection features. Accident detection can sense if you’ve had a fall and then alert your nominated contact to your fall and some notify them of your location. Doing research online into this different apps and products is this best way to determine which is best for you. 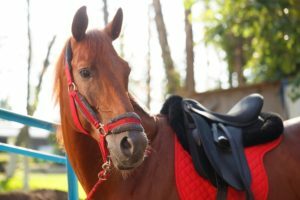 The equestrian market has many useful products to improve rider safety. However, knowing your horse, your own limits and applying common sense is what’ll keep you safest when out riding alone. Everything else I’ve mentioned will help though. Don’t want to ride out on your own anymore or have a horse that isn’t good a riding out on its own? And don’t know where to find someone to ride with? Try joining a riding club or group. This is a great way to meet new people and their horses. Searching social media for local riding clubs is a good place to start. Horse apps or equine websites are other good places to find local equestrian communities. 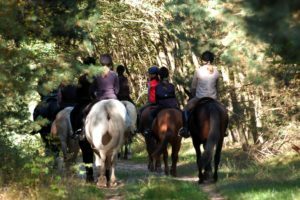 All these places are a great way to connect with others to go horse riding with! Stay safe and Happy Hacking!